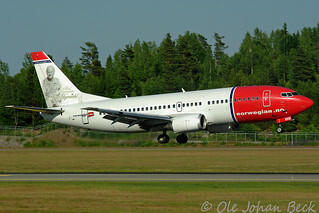 LN-KKM Norwegian Air Shuttle 29-04-2003, and inherited "Thor Heyerdahl" on the tail after the 735 LN-BRU. Seen arriving rwy 19R as DY727 from Trondheim, still in its original look with "Thor Heyerdahl" on its tail and "norwegian.no" on the fin and nose. It was modernized in 2010, until it gave "Thor Heyerdahl" to the 787-8 EI-LNB in 2013.